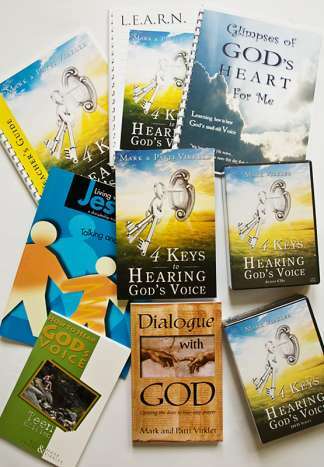 How to Hear God's Voice is the most practical training series in the world on discerning the voice of God! Through it, you will learn how to recognize the Lord speaking, and have full two-way dialogue with Him, guaranteed. 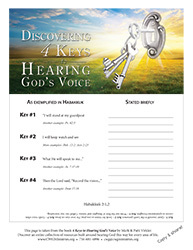 Get your 3 free How to Hear God's Voice videos that will teach you how to hear and discern God's voice every day. 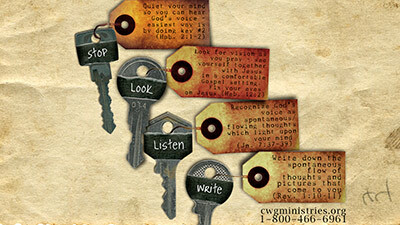 Dr. Mark Virkler introduces "4 Keys to Hearing God's Voice"
Trouble with the audio? Click here to use a different player. The #1 Tool in the World for Introducing People to Hearing God's Voice! She had done it again! Instead of coming straight home from school like she was supposed to, she had gone to her friend’s house. Without permission. Without our knowledge. Without doing her chores. With a ministering household that included remnants of three struggling families plus our own toddler and newborn, my wife simply couldn’t handle all the work on her own. Everyone had to pull their own weight. Everyone had age-appropriate tasks they were expected to complete. At fourteen, Rachel and her younger brother were living with us while her parents tried to overcome lifestyle patterns that had resulted in the children running away to escape the dysfunction. I felt sorry for Rachel, but, honestly my wife was my greatest concern. Now Rachel had ditched her chores to spend time with her friends. It wasn’t the first time, but if I had anything to say about it, it would be the last. I intended to lay down the law when she got home and make it very clear that if she was going to live under my roof, she would obey my rules. Habakkuk said, "I will stand on my guard post..." (Hab. 2:1). The first key to hearing God's voice is to go to a quiet place and still our own thoughts and emotions. Psalm 46:10 encourages us to be still, let go, cease striving, and know that He is God. In Psalm 37:7 we are called to “be still before the Lord and wait patiently for Him.” There is a deep inner knowing in our spirits that each of us can experience when we quiet our flesh and our minds. Practicing the art of biblical meditation helps silence the outer noise and distractions clamoring for our attention. I didn’t have a guard post but I did have an office, so I went there to quiet my temper and my mind. Loving God through a quiet worship song is one very effective way to become still. In 2 Kings 3, Elisha needed a word from the Lord so he said, “Bring me a minstrel,” and as the minstrel played, the Lord spoke. I have found that playing a worship song on my autoharp is the quickest way for me to come to stillness. I need to choose my song carefully; boisterous songs of praise do not bring me to stillness, but rather gentle songs that express my love and worship. And it isn’t enough just to sing the song into the cosmos – I come into the Lord’s presence most quickly and easily when I use my godly imagination to see the truth that He is right here with me and I sing my songs to Him, personally. “I will keep watch to see,” said the prophet. To receive the pure word of God, it is very important that my heart be properly focused as I become still, because my focus is the source of the intuitive flow. If I fix my eyes upon Jesus (Heb. 12:2), the intuitive flow comes from Jesus. But if I fix my gaze upon some desire of my heart, the intuitive flow comes out of that desire. To have a pure flow I must become still and carefully fix my eyes upon Jesus. Quietly worshiping the King and receiving out of the stillness that follows quite easily accomplishes this. So I used the second key to hearing God’s voice: As you pray, fix the eyes of your heart upon Jesus, seeing in the Spirit the dreams and visions of Almighty God. Habakkuk was actually looking for vision as he prayed. He opened the eyes of his heart, and looked into the spirit world to see what God wanted to show him. Being a logical, rational person, observable facts that could be verified by my physical senses were the foundations of my life, including my spiritual life. I had never thought of opening the eyes of my heart and looking for vision. However, I have come to believe that this is exactly what God wants me to do. He gave me eyes in my heart to see in the spirit the vision and movement of Almighty God. There is an active spirit world all around us, full of angels, demons, the Holy Spirit, the omnipresent Father, and His omnipresent Son, Jesus. The only reasons for me not to see this reality are unbelief or lack of knowledge. In his sermon in Acts 2:25, Peter refers to King David’s statement: “I saw the Lord always in my presence; for He is at my right hand, so that I will not be shaken.” The original psalm makes it clear that this was a decision of David’s, not a constant supernatural visitation: “I have set (literally, I have placed) the Lord continually before me; because He is at my right hand, I will not be shaken” (Ps.16:8). Because David knew that the Lord was always with him, he determined in his spirit to see that truth with the eyes of his heart as he went through life, knowing that this would keep his faith strong. In order to see, we must look. Daniel saw a vision in his mind and said, "I was looking...I kept looking...I kept looking" (Dan. 7:2, 9, 13). As I pray, I look for Jesus, and I watch as He speaks to me, doing and saying the things that are on His heart. Many Christians will find that if they will only look, they will see. Jesus is Emmanuel, God with us (Matt. 1:23). It is as simple as that. You can see Christ present with you because Christ is present with you. In fact, the vision may come so easily that you will be tempted to reject it, thinking that it is just you. But if you persist in recording these visions, your doubt will soon be overcome by faith as you recognize that the content of them could only be birthed in Almighty God. Immediately the thought came to me, “She is insecure.” Well, that certainly wasn’t my thought! Her behavior looked like rebellion to me, not insecurity. But like Habakkuk, I was coming to know the sound of God speaking to me (Hab. 2:2). Elijah described it as a still, small voice (I Kings 19:12). I had previously listened for an inner audible voice, and God does speak that way at times. However, I have found that usually, God's voice comes as spontaneous thoughts, visions, feelings, or impressions. For example, haven't you been driving down the road and had a thought come to you to pray for a certain person? Didn’t you believe it was God telling you to pray? What did God's voice sound like? Was it an audible voice, or was it a spontaneous thought that lit upon your mind? Experience indicates that we perceive spirit-level communication as spontaneous thoughts, impressions and visions, and Scripture confirms this in many ways. For example, one definition of paga, a Hebrew word for intercession, is "a chance encounter or an accidental intersecting." When God lays people on our hearts, He does it through paga, a chance-encounter thought “accidentally” intersecting our minds. So the third key to hearing God’s voice is recognizing that God's voice in your heart often sounds like a flow of spontaneous thoughts. Therefore, when I want to hear from God, I tune to chance-encounter or spontaneous thoughts. Finally, God told Habakkuk to record the vision (Hab. 2:2). This was not an isolated command. The Scriptures record many examples of individual’s prayers and God’s replies, such as the Psalms, many of the prophets, and Revelation. I have found that obeying this final principle amplified my confidence in my ability to hear God’s voice so that I could finally make living out of His initiatives a way of life. The fourth key, two-way journaling or the writing out of your prayers and God’s answers, brings great freedom in hearing God’s voice. I have found two-way journaling to be a fabulous catalyst for clearly discerning God's inner, spontaneous flow, because as I journal I am able to write in faith for long periods of time, simply believing it is God. I know that what I believe I have received from God must be tested. However, testing involves doubt and doubt blocks divine communication, so I do not want to test while I am trying to receive. (See James 1:5-8.) With journaling, I can receive in faith, knowing that when the flow has ended I can test and examine it carefully. My mind immediately objected: She is not flesh of my flesh. She is not related to me at all – she is a foster child, just living in my home temporarily. It was definitely time to test this “word from the Lord”! There are three possible sources of thoughts in our minds: ourselves, satan and the Holy Spirit. It was obvious that the words in my journal did not come from my own mind – I certainly didn’t see her as insecure or flesh of my flesh. And I sincerely doubted that satan would encourage me to love anyone unconditionally! Okay, it was starting to look like I might have actually received counsel from the Lord. It was consistent with the names and character of God as revealed in the Scripture, and totally contrary to the names and character of the enemy. So that meant that I was hearing from the Lord, and He wanted me to see the situation in a different light. Rachel was my daughter – part of my family not by blood but by the hand of God Himself. The chaos of her birth home had created deep insecurity about her worthiness to be loved by anyone, including me and including God. Only the unconditional love of the Lord expressed through an imperfect human would reach her heart. Needless to say, Patti immediately and without question confirmed that the Lord had spoken to me. My entire planned lecture was forgotten. I returned to my office anxious to hear more. As the Lord planted a new, supernatural love for Rachel within me, He showed me what to say and how to say it to not only address the current issue of household responsibility, but the deeper issues of love and acceptance and worthiness. Rachel and her brother remained as part of our family for another two years, giving us many opportunities to demonstrate and teach about the Father’s love, planting spiritual seeds in thirsty soil. We weren’t perfect and we didn’t solve all of her issues, but because I had learned to listen to the Lord, we were able to avoid creating more brokenness and separation. The four simple keys that the Lord showed me from Habakkuk have been used by people of all ages, from four to a hundred and four, from every continent, culture and denomination, to break through into intimate two-way conversations with their loving Father and dearest Friend. Omitting any one of the keys will prevent you from receiving all He wants to say to you. The order of the keys is not important, just that you use them all. Embracing all four, by faith, can change your life. Simply quiet yourself down, tune to spontaneity, look for vision, and journal. He is waiting to meet you there. You will be amazed when you journal! Doubt may hinder you at first, but throw it off, reminding yourself that it is a biblical concept, and that God is present, speaking to His children. Relax. When we cease our labors and enter His rest, God is free to flow (Heb. 4:10). Why not try it for yourself, right now? Sit back comfortably, take out your pen and paper, and smile. Turn your attention toward the Lord in praise and worship, seeking His face. 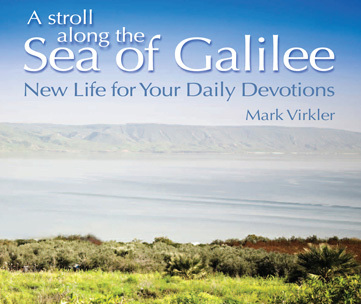 Many people have found the music and visionary prayer called “A Stroll Along the Sea of Galilee” helpful in getting them started. You can listen to it and download it free at www.CWGMinistries.org/Galilee. After you write your question to Him, become still, fixing your gaze on Jesus. You will suddenly have a very good thought. Don't doubt it; simply write it down. Later, as you read your journaling, you, too, will be blessed to discover that you are indeed dialoguing with God. If you wonder if it is really the Lord speaking to you, share it with your spouse or a friend. Their input will encourage your faith and strengthen your commitment to spend time getting to know the Lover of your soul more intimately than you ever dreamed possible. Thoughts from our own minds are progressive, with one thought leading to the next, however tangentially. Thoughts from the spirit world are spontaneous. The Hebrew word for true prophecy is naba, which literally means to bubble up, whereas false prophecy is ziyd meaning to boil up. True words from the Lord will bubble up from our innermost being; we don’t need to cook them up ourselves. God will never say something to you personally which is contrary to His universal revelation as expressed in the Scriptures. If the Bible clearly states that something is a sin, no amount of journaling can make it right. Much of what you journal about will not be specifically addressed in the Bible, however, so an understanding of biblical principles is also needed. Anything God says to you will be in harmony with His essential nature. Journaling will help you get to know God personally, but knowing what the Bible says about Him will help you discern what words are from Him. Make sure the tenor of your journaling lines up with the character of God as described in the names of the Father, Son and Holy Spirit. What effect does what you are hearing have on your soul and your spirit? Words from the Lord will quicken your faith and increase your love, peace and joy. They will stimulate a sense of humility within you as you become more aware of Who God is and who you are. On the other hand, any words you receive which cause you to fear or doubt, which bring you into confusion or anxiety, or which stroke your ego (especially if you hear something that is “just for you alone – no one else is worthy”) must be immediately rebuked and rejected as lies of the enemy. We are members of a Body! A cord of three strands is not easily broken and God’s intention has always been for us to grow together. Nothing will increase your faith in your ability to hear from God like having it confirmed by two or three other people! Share it with your spouse, your parents, your friends, your elder, your group leader, even your grown children can be your sounding board. They don’t need to be perfect or super-spiritual; they just need to love you, be committed to being available to you, have a solid biblical orientation, and most importantly, they must also willingly and easily receive counsel. Avoid the authoritarian who insists that because of their standing in the church or with God, they no longer need to listen to others. Find two or three people and let them confirm that you are hearing from God! What you've just read merely scratches the surface of all you can learn about hearing God's voice. 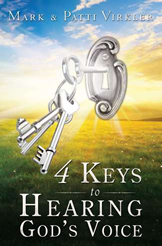 The 300-page text, 4 Keys to Hearing God's Voice will teach you these four keys in-depth. This book can be completed individually or in a small group, and there are audio CDs, DVDs, workbooks and Teacher's Guides to help maximize your learning experience. For a true mentorship opportunity, invest in the full Communion With God college course. You will earn college credit while mastering the ability to hear the voice of God. You may then choose to go on and earn your certificate or degree from Christian Leadership University, where each course will guide you into receiving direct revelation from God on a subject, and actually allow Him to become your primary Instructor. How Is a Life Impacted by Learning to Hear God's Voice? We stand amazed by the power of these 4 keys to bring intimacy and transformation into people's hearts! Click here to read more about the profound impact this course has had. Our Training on Hearing God's Voice Is the Most Effective in the World Today! Below are some responses from a survey of people who recently completed our 3-month training module entitled How to Hear God’s Voice. Eighty percent had been believers for more than 25 years, so these are responses from seasoned Christians and were offered at the conclusion of the course! 97% felt their intimacy with God had increased. 92% said their interpersonal relationships have greatly improved. 94% said they were more at peace with themselves and God. 94% said sin and negative thoughts were diminishing. 95% considered it one of the top training experiences in their life. The pastor said he considered it the top training experience in their 30+ years as a church. You may view the entire survey here. Download this free PowerPoint which assists you when you do the presentation and this one-page handout which you may print and make available to each participant. Lord, do You love me? Lord, what would You like to say to me? Then lead them in a 5 minute visionary walk along the Sea of Galilee (which you can download free from here, and play for them). Afterward, have them break into groups of two and read their journaling to someone. Ask people to affirm each other if they sense the journaling is from God (which it almost always is). People are not required to share their journaling if they feel it is too personal. Have a few volunteers read their journaling to the entire group, and affirm/applaud each one. Close in a prayer of thankfulness. Encourage people to go deeper by accessing the training below. Hearing God's Voice is an interactive, online, 12-week training experience available instantly on your smart phone, tablet or computer. You receive 10 hours of MP3s and video downloads in which Dr. Virkler guides you step by step into the experience of hearing God's voice. Complete with ebook, eworkbook and online self-scoring quizzes to insure you have mastered all key truths, we guarantee you will hear God's voice easily when you have completed this training. It can be your first step toward receiving our Diploma in Applied Spirituality from CLU's School of the Spirit. Click here for testimonies about the profound impact this course has had on lives, marriages, families and ministries. There are small groups all over the United States, and several throughout the world, who are delving into the mysteries of hearing God's voice. Team up with them to accelerate your growth! Or connect worldwide from home through Koinonia Network: The Online Home for Spirit-filled Christians -- Bringing the Voice of God to Our Generation Through YOU! Be sure to read the helpful article "Overcoming Blocks and Hindrances to Hearing God's Voice." You will also find many other free books and articles available on our website. Click here to get free 'Four Keys' downloadable wallpaper for your computer desktop (shown at right). When wallpaper loads after clicking the link, right-click and "Set as Background". Blog: How Did Over a Million People Learn to Recognize God’s Voice? Also, each free monthly issue of our email newsletter God's Voice Worldwide features new, inspirational conversations with God from people all over the world just like you. Learn more and subscribe for free today! Tu Puoi Ascoltare la Voce di Dio! Osese Fun o Lati Le Gbo Ohun Olorun!